Gravity Forms ActiveCampaign Add-on lets you send subscribers to your email list with ease. You can integrate different forms with different email list or send subscribers conditionally to your list. In this article, I will give you in-depth details about all the settings and features of Gravity Forms ActiveCampaign Addon. Why Use Gravity Forms when you can use ActiveCampaign Forms? There are plenty of advantages of using Gravity Forms as compared to ActiveCampaign’s native forms. Form submissions are stored in WordPress. If you have a long form then you don’t want to send all of that data to Active Campaign. With Gravity Forms you can send only the desired data like name, email, phone number etc. However, you can check the complete submission in from WordPress anytime. Conditional Logic: Sometimes you may not want every form submission to be sent to ActiveCampaign. With conditional logic can create rules to filter and send only those submissions which meet the criteria. ActiveCampaigns native forms are no match to Gravity Forms functionality. Gravity Forms has advanced functionality like user registration, chained selects etc which aren’t available in ActiveCampaign. Features of Gravity Forms ActiveCampaign Addon. Easy to Use: With just a few basic steps you can configure your form to send subscribers to ActiveCampaing. Flexible: You can easily send custom data to your list. Conditional Logic: This is probably one of the most useful and advanced features that lets you only send the subscribers that you want. GDPR complaint: Gravity Forms is GDPR complaint. You can give the option in your form so, that users can check whether they should be added to the mailing list or not. Send the Last Broadcast: It is possible to send your last broadcast to new users with Send Last Broadcast feature. How to Connect Gravity Forms with ActiveCampaign. Once you have installed and activated the addon then go to ‘Forms -> Settings’ menu. Now navigate to ActiveCampaign tab. Here you will need to enter the API URL and API key for your account. You can find these details under ‘My Settings -> Developer’ in your active Campaign account. Now click on Update Settings and if the details are successfully verified then you will get a green checkmark to indicate that. These settings are required to be done only once and once you have completed the above steps then you are ready to connect as many forms as you want. Connect Gravity Forms with ActiveCampaign. How to Connect your Form to Active Campaign. 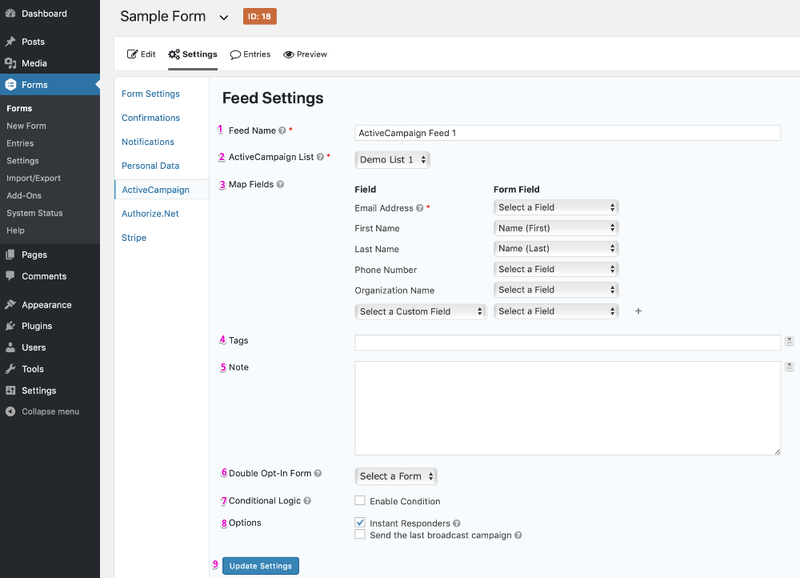 To connect your Form to ActiveCampaign you need to add and configure feed for it. Step by Step Instructions for creating Active Campaign Feed. Click on Forms menu in WordPress Dashboard Sidebar. This will open the list of all the forms you have created. Hover over the Settings menu of your desired form and then click on ActiveCampaign. This will open the feed section. Now click on Add New to create your first feed. Enter the Feed Name. This is just for your reference and it is never shown to your site users. So, you can name it whatever Now select the list to which you want to send subscribers. Gravity Forms automatically fetches all lists from your Active Campaign account. Field Mapping: This is where you configure how the content is sent to ActiveCampaing. You can map your form fields to respective fields in ActiveCapaign ( including custom fields ). You can also add tags and notes to be sent with each submission. Double Opt-In settings let you select the form which should be used for sending double optin email. Conditional logic lets you add users to the list depending upon how what information the user has filled while submitting the form. You can also enable Instant Responder and Last Broadcast features. Once you have completed all the above steps then your form is ready for sending subscribers. 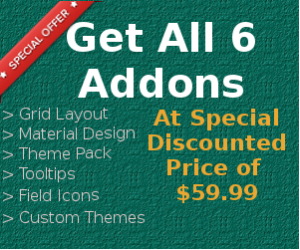 If you have purchased any of the Gravity Forms licenses ( Basic, Pro or Elite ) then you are eligible to download this addon from their website. General Queries related to this article. Can you send your existing entries to ActiveCampaing list? It is not possible to send existing entries with the plugin. However, this can be done by custom code and you can hire me to do so. How can I make my Newsletter form look Attractive? You can style your form with free Styles & Layouts plugin without any CSS coding. Is it possible to send data to more than one list? Yes, you can send subscriber data to more than one list by creating multiple feeds ( one feed for each list ). How long does it take for feed to become active? The feed becomes active the moment you publish it. Is it possible to temporarily disable the feed? Yes, you can disable and activate feeds without losing your settings.